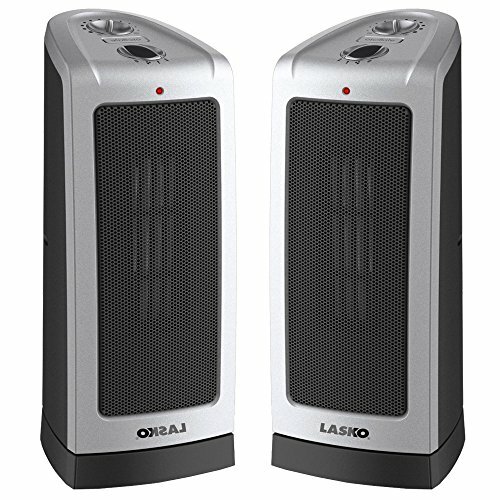 Lasko 5307 Oscillating Ceramic Tower Heater is a 16-inch unit for a versatile size that's perfect for floor or table use. It features high, low, and adjustable thermostat settings and Comfort Air Technology to propel warmth into rooms. The Lasko 5307 Oscillating Ceramic Tower Heater offers 1500 watts of quiet, comforting warmth, including a fan-only setting, and comes fully assembled. Has built in safety features and easy push-button oscillation as well! Comfort was never so close, safe, or affordable! Product Details Designed for either floor or table top use, this heater is versitile enough to warm any space in your home. Choose your ideal heat setting: High, Low, or Fan Only, all of which feature quietly propelled air. This no hassle heater comes fully assembled, ready to plug in, turn on, and heat your home. You can either get direct heat, perfect for warming your feet under your desk, or oscillating heat, perfect for warming a small room. This heater is fully equipped with built in safety features so you don't have to be nervous about having it in your home with children or pets. Designed for either floor or table top use, this heater is versitile enough to warm any space in your home. Choose your ideal heat setting: High, Low, or Fan Only, all of which feature quietly propelled air. This no hassle heater comes fully assembled, ready to plug in, turn on, and heat your home. You can either get direct heat, perfect for warming your feet under your desk, or oscillating heat, perfect for warming a small room. This heater is fully equipped with built in safety features so you don't have to be nervous about having it in your home with children or pets.